I was so happy that some of you enjoyed my first post about the cost of my food-based FOMO. I see, though, that I left a gray area in my story about exactly how I got over it. It was actually a very slow process that involved some self-reflecting, prioritizing goals, and concrete tips that I either cultivated on my own or found repeated on several websites. I’m not perfect, and I still catch myself reaching for food out of habit rather than hunger, but I am more aware of these instincts and give in to them less easily. Below are the steps that helped me the most during my journey to overcome my food-FOMO. I know that food can be a very personal subject, and what worked for me may not necessarily work for you. Nevertheless, I hope you can still use my story as inspiration to keep pushing forward and find what personally works for you in your journey. In the beginning, I couldn’t make any sustainable changes to my lifestyle because I simply thought the problem was that I was binging. I tried using tips I found to binge less, but that didn’t help much. When I finally took the time to reflect, I realized that the core issue was my relationship with food — specifically, a “Fear Of Missing Out”-type of relationship. Next, I had to answer why my food-based FOMO was a problem. I thought about food ALL THE TIME and couldn’t focus on other areas of my life. I always felt unsatisfied, no matter how much or how exquisite the food I ate was. My lack of control constantly led to negative emotions like guilt and shame. I wanted food to make up for my dissatisfaction with my life, and it never could. My health, finances, and self-view suffered. Without answering why it was a problem, my attempt to make changes would have no backbone, and I would have easily succumbed to my cycle. But establishing the why it helped strengthen my will to not give up even if I temporarily relapsed. I am a creature of habit: I used to eat at the same time and the same amount of food almost every day, whether I was hungry or not. I’m an emotional eater, so it is very easy for me to turn to food as a coping mechanism, whether I’m happy, sad, stressed, or anxious. When I was young, my dad would force me to finish everything on my dinner plate even if I was super full. As a result, I got used to overeating on a daily basis, and I felt I HAD to finish my food no matter what. My dad ate cookies and ice cream every night for years without fail, and always seemed to be in a better mood afterward. My sister and I followed suit in developing a sweet tooth. I also turned to certain foods or restaurants because I associated them with good feelings due to past experiences from my childhood up to my college days. When I graduated and started my post-grad life by moving back home to find a job, my food-based FOMO truly crystallized as I was having my quarter-century crisis. Comparing myself to friends or other millennials, I concluded that I wasn’t living a life filled with enough purpose, fun, and prestige. My foodie instincts took over and I turned to food to take my mind off of my “shameful” life and to experience some temporary excitement. After establishing why my relationship with food was an issue, I took a step further and defined the life goals I wanted to pursue that I would not let food compromise. My general life goals were to restart my financial budget and develop a healthier lifestyle. These goals were helpful in my journey to overcome my food-based FOMO. By being deliberate with these goals, I developed an even stronger mindset that would make me more likely to succeed. When I felt frustrated and questioned why I was going through all this trouble to change my lifestyle, I turned to my goals as motivation to keep going. My goals gave me a structure for making my food-based decisions every day. Instead of trying to convince myself that I shouldn’t eat something “just because I shouldn’t,” I went through a reasonable decision-making process based on my goals that satisfied my brain and helped me move on more quickly. My goals reminded me that other things in life could bring me happiness rather than food. Being healthy and financially stable again were two things that would help me feel confident about myself and therefore bring true happiness. Health websites that answer nutrition questions, such as why we crave junk food and why, exactly, it’s bad for us. Overall fitness websites that had workout ideas, informative articles, and recipes, such as Livestrong.com. Easy home cooking recipes that helped me learn how to enjoy healthy and satisfying meals at home while saving money. I particularly love Pick Up Limes. I always wanted a treat in the evening if I worked out that day. I had a particular weakness for ice cream, brownies, muffins, and donuts. If someone offered me dessert, I never turned it down. If I felt really stressed at work, I would reach for sweets to keep me going. If I had to make a long drive for something work-related, I always got a fancy drink from Starbucks because I “deserved” it. I often forced myself to overeat because I couldn’t fathom letting leftovers go bad and be tossed in the trash. After discovering what my worst habits were through my food journaling, I decided to pick one habit to break from for one day. The first day is usually the hardest when starting anything challenging, but treating it as being just one day makes the task seem less daunting, and the next day will feel easier. And even when I have times where I revert back to my old habit, I remember I was able to fight it for one day and that I can do it again. When my parents were away on a trip this year, I got into the habit of buying frozen desserts so I would have something to indulge in every night. After so many nights of feeling guilty after inhaling a huge helping of chocolate chip cookie dough and vanilla ice cream, I realized this had to stop. I made the goal that for the next day, I would NOT eat any of the frozen desserts I had leftover in my fridge. Even if I stuffed myself with a second helping of dinner, it didn’t matter as long as I broke through this specific habit for one day. After that one day, I realized the next day that I was totally fine and that I felt more energetic, thanks to forgoing all the sugar. I felt motivated to keep going and ended up being able to continue the “fast” for a couple more days. When I have days where tempting food is right in front of me and so hard to resist, I often repeat to myself a couple of these statements or questions I’ve cultivated in order to be more mindful of my decisions and to keep me centered on my goals. 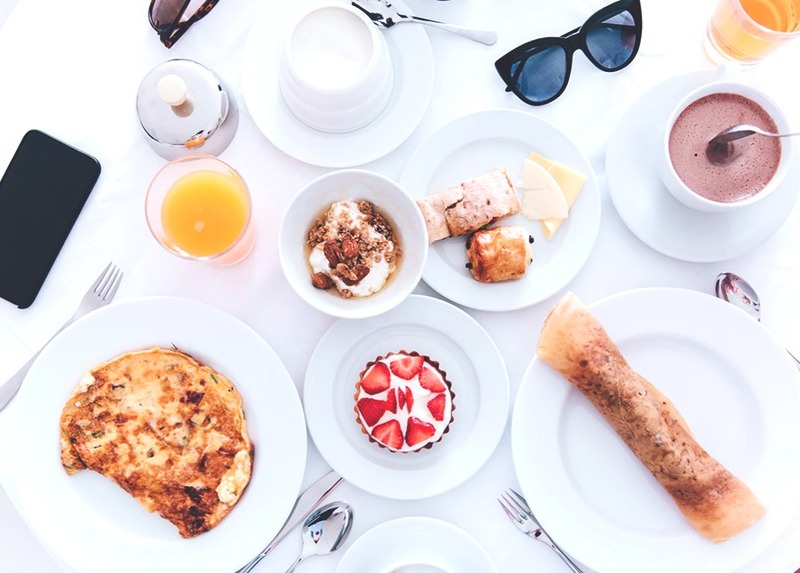 “Would I be willing to eat it by myself in my house, and still enjoy it?” Oftentimes we associate food with pleasure because of the wonderful memories we’ve made while eating that certain food or sharing a meal together at that certain cafe. I make sure the food I’m contemplating is really worth it by asking if I would be willing to eat it alone at home, where the atmosphere is less exciting and the attention is only on the food. “Could I probably make this at home?” Since one of my goals is to stick by my financial budget, often times I’m able to stop myself from eating out or purchasing certain treats by asking myself if I could replicate the food at home. If the answer is yes, then I know it’s not really worth the price and I have a stronger resolve to decline to purchase. If I truly want the food, then I should be willing to buy the ingredients and make it myself at home. “I could have some now, but maybe I’ll have some next time.” It is so easy to push back a task for weeks or even months by using the words “I’ll do it later.” For the goal of resisting temptation, I use this to my advantage. If I told myself I absolutely couldn’t have a certain food or treat, it would feel like punishment. Instead, I just say that maybe I’ll have some later. This way feels less strict, and before I know it, I usually forget about the temptation within an hour. As you can see, improving my relationship with food was a messy and lengthy process that’s still ongoing. I hope people can see from my story that mending your relationship with food and reclaiming your life is possible if you believe in yourself and have patience! Let me know in the comments your personal story or anything that has helped you with your food issue.